Steel Crest Basic Series decorative baseboard registers allow you to design a baseboard diffuser to match your specific style. Choose from 3 attractive designs and 4 finishes. 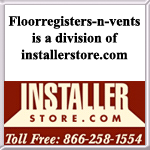 This baseboard vent cover includes a single-piece damper that allows you the ability to completely close off or leave open the airflow. With a height of 4.75 inches, this decorative baseboard register is taller and more attractive than traditional baseboard diffusers. 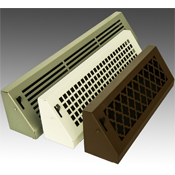 Each baseboard vent cover is made of heavy-duty 18 gauge steel with a durable powder-coated finish. This decorative baseboard register is sold in the common lengths of 15 inch, 18 inch and 24 inch. At this time, the manufacturer does not offer this Basic Series line in a Baseboard Return (no damper) or custom sizes. This special order decorative baseboard diffuser is considered non-returnable. Orders take approximately 2-4 business weeks to ship direct from the manufacturer, and cannot be cancelled once placed. If you need a size other than what is listed, or would like more design and finish choices, Steel Crest offers another line of baseboard diffusers and baseboard return covers.